This week’s diva challenge is to use stripes. I like this challenge because it is relatively easy. I decided to do about 3 horizontal stripes. 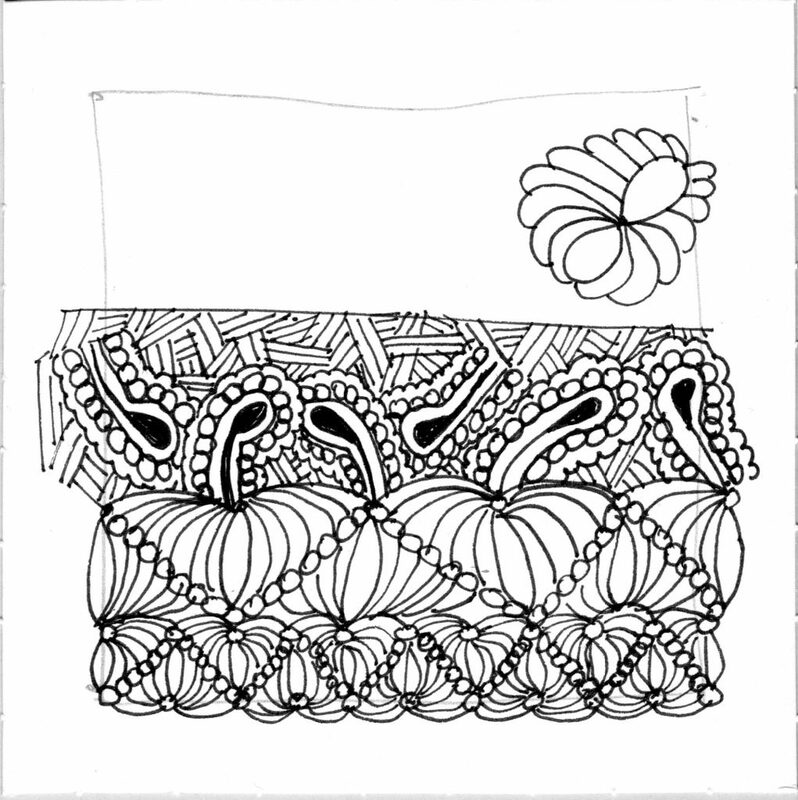 I checked the Square One: Purely Zentangle focus tangle and found it to be Paizel, which can be found on tanglepatterns.com. I like the basics of this tangle but not the Nekton background to it but I used it anyway. The pattern for the day over on Pattern-collections.com is 8’n wing. I wasn’t sure if I’d add this one to the tile or not but in the end, decided to go ahead and put one bit of it above the stripes. The one pattern I just chose at random was Drogon by Lily Moon. 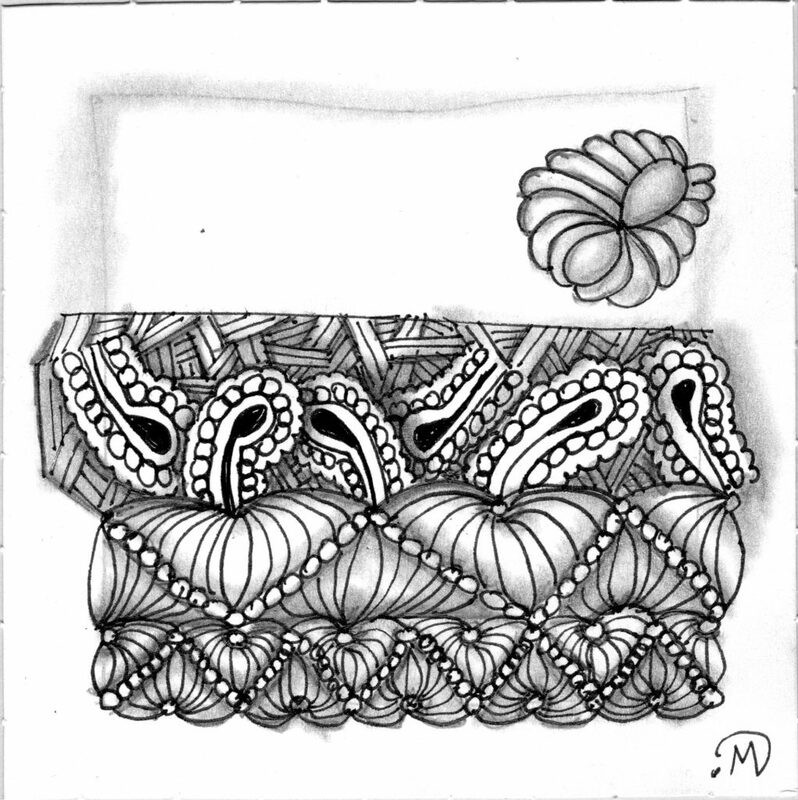 I really liked this tangle and its simplicity when I used it last time, so I decided to play with it a bit more. It will take me quite some time before I do it justice in my shading though. It is fun to learn. I’ve really learned how to shade so as to cover up my jiggly, wiggly, line art. It is always at this point, when I see the tile enlarged on-screen, that I notice the areas where I should’ve blended the shading a bit more but by that time, I’m usually rushed and in a hurry to get it posted. So, as always, I see the imperfections once again. But it doesn’t matter because I enjoyed doing this one, even if I did rush it a little bit. Thanks once again for your kind comments. They encourage me to continue sharing. Sometimes I share it here and on facebook groups but then other times, I only share it here with you. Thanks for your encouragement. Oh, Maggibee! This one was definitely more my taste; I hope it was for you as well.